The empanada was shown in response to the shifting tastes of the Spanish-era Ilustrados. Immersed in the lifestyle of their colonial masters, the tastes and preferences of these educated elite were strongly influenced by the West, but time came when their palates looked for something novel. They wanted a fusion between the Western way of cooking and rich native flavors. Thus, the Batac Empanada which is one reason why Ilocos Norte today is known as a gastronomic mecca. This was shown in the well-executed Kitchen Musicale where, in a party hosted by a Señora, Ilustrados refused to eat the usual fare (e.g.hamon, paella, lechon, embutido), moving the servant Indios to serve the Batac Empanada. 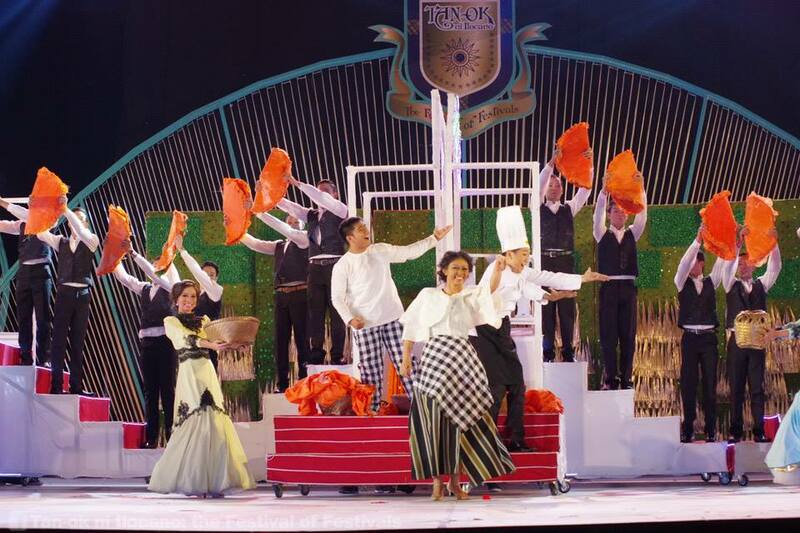 The set design and props—a work of love of a number of students and city employees—were well-crafted and did not steal the thunder from the performers themselves, unlike Batac’s 2012 performance where overemphasis on the “Higantes” somehow overshadowed the dancers. Batac’s appropriate costuming was specifically lauded by Floy Quintos, arguably the most distinguished among the seven Tan-ok judges. 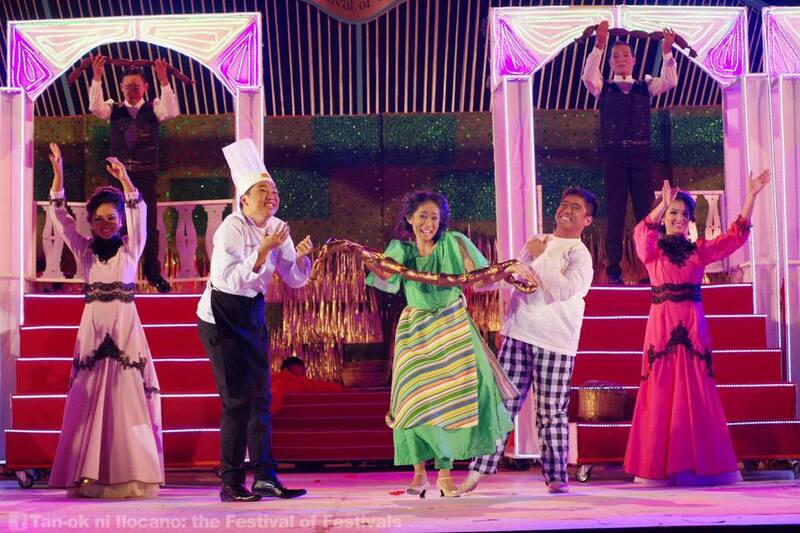 The veteran stage director and five-time Palanca awardee noted that Batac’s costumes strengthened the performers’ characterization, drawing a clear distinction between the Ilustrados and the Indios. The judges also noted that some dancers in other contingents failed to wear their costumes properly. They cited as an example the Nelly character of Pinili and some ants who failed to attach their “tails” in Banna’s Panagabuos. 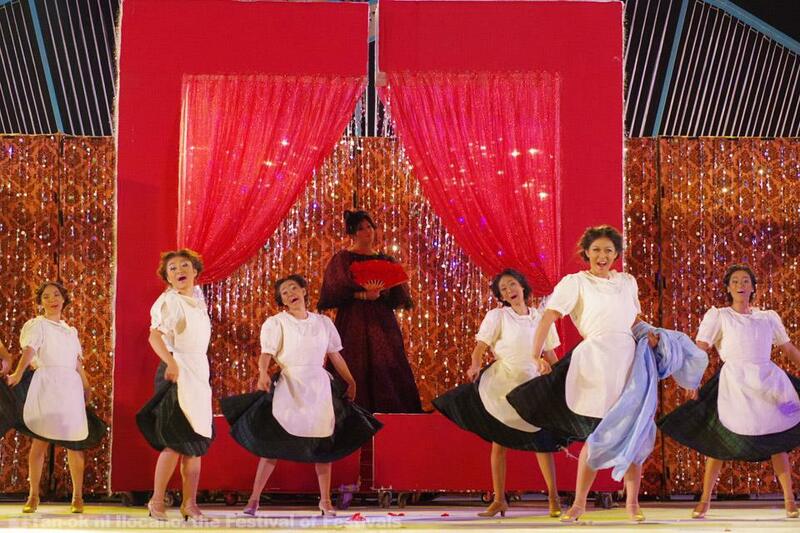 Batac’s costumes were created by Windell Madis, a well-known fashion designer in the young city. Humble and assuming, I believe that Madis, who delivered the goods out of a very limited budget, deserves more recognition than what he is currently getting. Unknown to the audience, there was one Batac dancer, an ilustrado, who failed to appear in the last part because she failed to promptly wear a part of her outfit. But the glitch went unnoticed because the dancers knew what exactly to do in such eventuality. And this leads me to the next part. Lew Jerez, their choreographer, and his associates Rhenz April Joaquin and Rogiemel Flojo are to be credited for this, but also an important contributor was lawyer Chito Nalupta who happens to be the mayor’s older brother. Known for being strict, focused, and well-spoken, Atty. Chito pushed the performers to their limits, instilling in them discipline and creativity in the process. He could be pushy at times but only because he imposes the same on himself. Always present during practices, he was keen on details. “That movement is more fit for a contestant in Miss Gay than for an ilustrado,” he once told a lady dancer, and the message got across. When I saw him dirty his hands on the props just like anybody else a day before the competition, I smiled, realizing how passionate he really is not only about winning, but in giving a good show. Going back to the dancers, they are honestly a cut above the rest. Most of them are from MMSU, and some have been my students. Judeleah Pucan, for instance, won back-to-back as best female performer. At first, Leah wanted to be an Ilustrado. Perhaps she was enticed with the glitz and glamor of the character and maybe she wanted to experience how to be in that elite stature even just for 6 minutes. 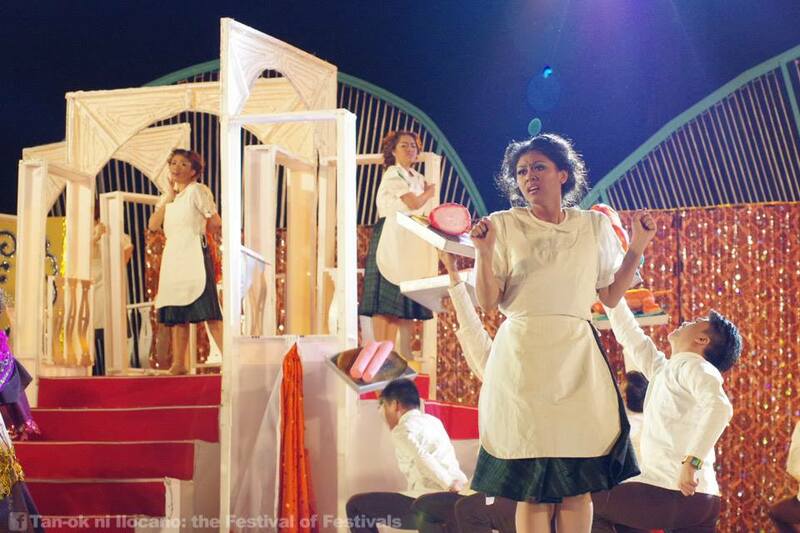 She ended up playing the role of a maid, but her act got the judges’ eyes and nods. All the other dancers had good skills, but also “puso” in their art. 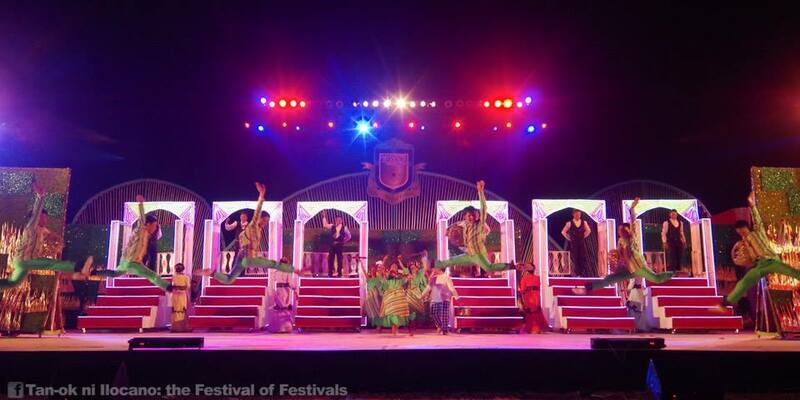 I know how much time and energy they, and everyone involved, sacrificed for Tan-ok.
As a fan of musicales who has memorized most lines in plays like Evita and Les Miserables, I really enjoyed Batac’s well-crafted festival song which was rightfully recognized as best this year, repeating last year’s feat. I have, in fact, even as I write this critique, under LSS. It’s the default music whenever I start up my car; you can ask my passengers about this.The music was engaging and the substantial lyrics fell exactly where they should. The seamless arrangement was the work of couple Jeorge and Josephine Pastorin who are mostly busy churning out political jingles during election seasons. While I really appreciated the song, however, I had serious doubts whether it will work well for the judges who don’t understand Ilocano. Thank God they were not myopic minded. The judges realized that the show is not really for them, but is mainly for Ilocanos. The whole next paragraph is quoted verbatim from Quintos. And here, dear karikna, is the best part of Quintos’ impressions on Batac, “I really like that show because pinag-isipan. (Imagine the verbally flamboyant director saying “pinag-isipan” with full emphasis.) 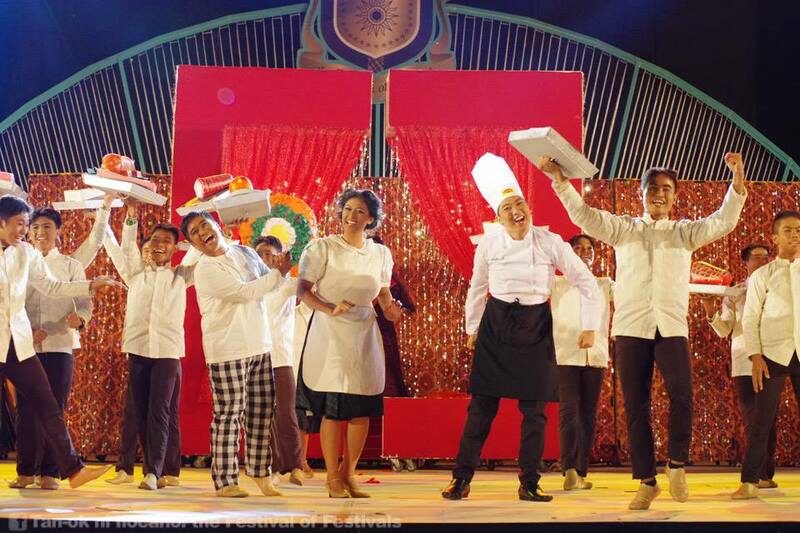 Talagang, sige, let’s do a full-length kitchen musicale, and let’s do it well.” This means so much coming from one of the most brilliant figures in the Philippine theater scene. Methinks Batac excellently accomplished what they intended to do: stage a fine musicale. It was as good as it could get. It is difficult, unfair even, to compare it to performances that employed the dance theater format. My suspicion is that given the vast stage and venue, and considering the time limit, dance-heavy routines struck the judges and the audience more heavily. 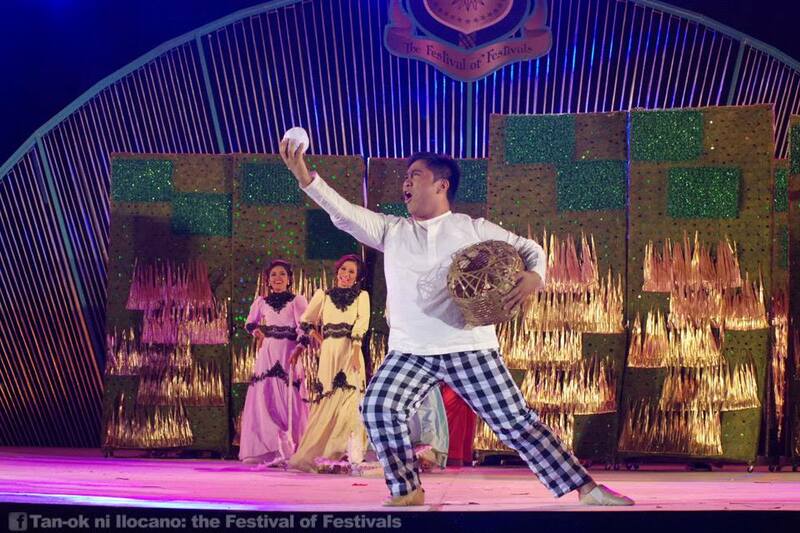 I have heard comments, for instance, that there is a lack of “Wow” moments in Batac’s performance. But, to me, how Batac put together the fantastic musicale that is very good in every respect is the ultimate w-o-w moment. Truth is, I get to appreciate it more each time I watch it on video. One more important thing that I personally observed and even heard from their participants themselves is their strong resolve not to have the competition get into the way of having fun. And so they keep on exploring… they keep searching for what is outside the box… they crave and salivate, just like the Ilustrados in their story, for new things, even if it means leaving their comfort zones and risking a lower rank in the score sheets. Those who say that Batac deteriorated just because they ranked fourth are actually telling more about themselves than the Batac contingent. Their idiocy is beyond repair. hopefully next year the fifth year they will not land 5th place .as it is its like a numerical succession first year the were first second year second third year third and fourth year fourth…let’s break this cycle next year they will come out fighting again….win or lose they gave it their all and they had fun ..that’s what counts . I am from Laoag but i was surprised sa decision ng mga judges. To me, Batac should be ranked higher that 4th. i think the competition was all about props.. haha i think its time for batac to provide more fabolous and extraordinary props!! bigger the better, many props the winner!!! batac deserves a higher rank because theyre comparable.!!! from what i heard, the singers are comprise of former and present members of the MMSU Nasudi choral group all from batac except for one who’s from laoag under the choral direction of kingsley tagatac.